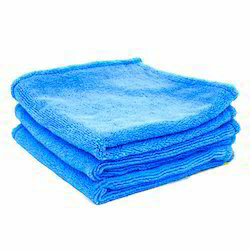 We offer high quality microfiber cloth for cleaning households, offices, cars and for various cleaning and dusting purposes in industries. Our microfiber cloth is of high quality 280 GSM and 310 GSM. Our microfiber cloth comes in size 40 Cm X 40 Cm. Our microfiber cloth is available at the most affordable prices. 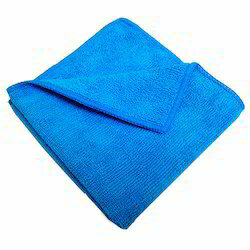 We are renowned manufacturer and supplier of Microfiber Wiping Cloth. We manufacture high quality and high density Microfiber Wiping Cloth of 300 GSM high density. Our Microfiber Wiping Cloth has high quality combination of 80% Polyester and 20% Polyamide. Our Microfiber Wiping Cloth is available at the most economical price. 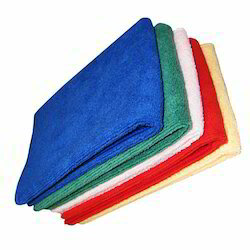 We are well reckoned manufacturer and supplier of high quality Microfiber Cloth which is widely used for cleaning and dusting in car service centers, hotels, malls, hospitals, cleaning industry, railways and various other institutions. Our Microfiber Cloth is high density cloth with 300 GSM density. We manufacture our Microfiber Cloth with high precision and quality and offer it at most economical price. Restaurants, hotels & hospitality venues; hospitals, clinics & medical facilities. Industrial wiping & manufacturing operations; production lines & factories. Car washes, auto & motorcycle dealerships, janitorial uses & commercial cleaning. Environmentally sound- a green alternative to paper towels. We are well reckon manufacturers and suppliers of lint free microfiber cloth, which is widely used for cleaning cars, glasses, various cleaning in hotels, malls, institutions, hospitals, industries. Our lint free cloth is available at the most affordable prices. 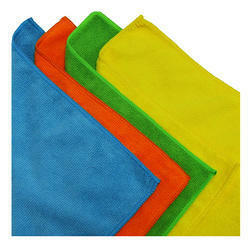 We are well reckon manufacturers, importers and suppliers of microfiber cleaning cloth. Our microfiber cleaning cloth is made with high precision deploying latest technology and 300 GSM high density microfiber. Our high density microfiber cloth is super dust and water absorbant. It is most widely used in car service centers, hotels, malls, hospitals, various institutions for cleaning and dusting.